polycistronic mRNA. In contrast, eukaryotic ribosomes usually need the mRNA 5'-end to form the association complex; the cap contributes to such an association (see Chapter 15). With eukaryotic mRNA it is the first AUG from the 5'-end that in most cases serves as an initiation codon, although there are exceptions to this rule. At the same time some special eukaryotic mRNAs use the alternative mechanism of internal initiation which is found also intrinsic to the eukaryotic protein-synthesizing system; in such a case the initiation codon (AUG) situated far away from the 5'-end is preceded by a massive structural element, the so-called internal ribosome entry site, or IRES (see Section 15.3.3). The three-dimensional structures of mRNAs have yet to be determined. Measurements of various physical parameters of several mRNAs have demonstrated that these molecules may possess extensively folded structures with a large number of intrachain interactions due to the Watson-Crick complementary base pair formation, as well as non-canonical hydrogen bonding between nucleotides. Although mRNAs are not double helices of the DNA type, they do have a well developed secondary structure because of the complementary pairing of different regions of the same chain with each other; this results in a large number of relatively short double-helical regions being formed. About 70% of all the nucleotide residues in the chain may typically participate in the complementary pairing and, correspondingly, in the formation of intramolecular helices. Most of the double-helical regions appear to be formed by the complementary pairing of adjacent sections in the polynucleotide chain; the model of the formation of such short helices is given schematically in Fig. 2.5. The complementary pairing of distant chain sections may result in the additional folding of the structure. These interactions are based mainly on A:U and G:C pairing (Watson-Crick pairs), as well as on G:U pairing (see Section 3.2.2). There is evidence suggesting that the secondary and tertiary structures of mRNA may play an important role in translation and its regulation. This problem will be considered in Chapters 15 to 17. It should be emphasized that after initiation of translation the ribosomes may perform a readout more or less independently on the secondary and tertiary structure of mRNA. It is likely that they sequentially unfold the mRNA chain while moving along (of course, the chain sections refold after the ribosomes have moved away). At the moment, very little is known about the part played by the secondary and tertiary mRNA structures in the rate with which ribosomes move along the RNA chain, i.e. the rate of polypeptide elongation. It is known that this rate is non-uniform and it may well be that it depends on the presence and stability of the secondary and tertiary structure in different mRNA regions. As already mentioned, the presence of a special three-dimensional structure at UGA codon in the coding sequence determines the incorporation of selenocysteine, instead of inducing the regular stop signal (see Section 10.2.2 for more detail). Also some special folds within coding sequences may provoke frameshifting, or even jumping of translating ribosomes over a section of mRNA during elongation (see Sections 12.4.2 and 12.4.3). Figure 2.5. 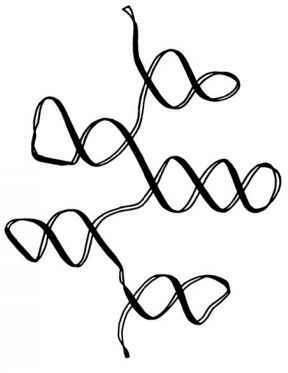 Schematic model illustrating the formation of a secondary structure (double-helical hairpins) by pairing of the adjacent sections of the RNA polynucleotide chain (P. Doty, H. Boedtker, J. R. Fresco, R. Haselkorn & M. Litt, Proc. Natl. Acad. Sci. USA 45, 482-499, 1959; A. S. Spirin, J. Mol. Biol. 2, 4360446, 1960). Particular attention should be paid to noncoding mRNA sequences. Specifically, their function may be to create the specialized three-dimensional secondary and tertiary structures that control initiation, elongation, sometimes termination and reinitiation. 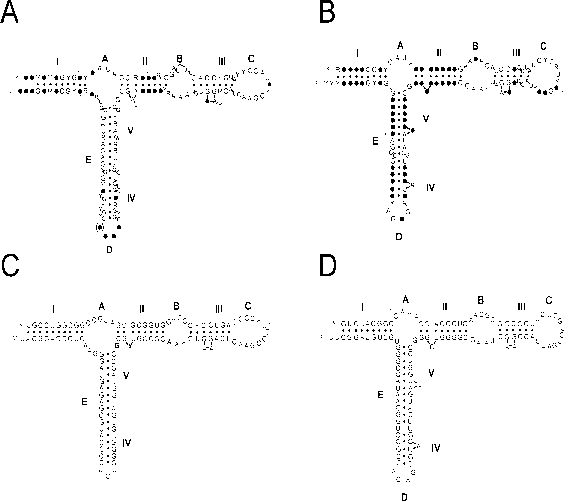 In Prokaryotes the non-coding intercistronic spacers affect the transition of ribosomes from one cistron to another. In Eukaryotes the 5'- and 3'-untranslated regions determine the binding to mRNA of special recognition proteins which affect translation and also may govern conservation and degradation of mRNA, its intracellular transport and specific intracellular localization.